The Rotary Club of Rotorua was chartered on 21 December, 1927. It is the oldest of the five Rotary Clubs in Rotorua and has about 50 active members. Rotorua Rotary is a luncheon club meeting Mondays at 12.30pm (except Public Holidays) at the Sudima Hotel, 1000 Eruera Street, Rotorua. Rotorua is situated in the Central North Island of New Zealand. The city has a population of about 66,000. The main industries are forestry, agriculture and tourism. The tourism industry is based on geothermal activity (geysers, boiling mud pools, and hot lakes), Maori art and culture, the scenery that includes fourteen beautiful lakes, excellent trout fishing, and a wide range of adventure tourism activities. See www.rotoruanz.com for more information and for a map of the city. 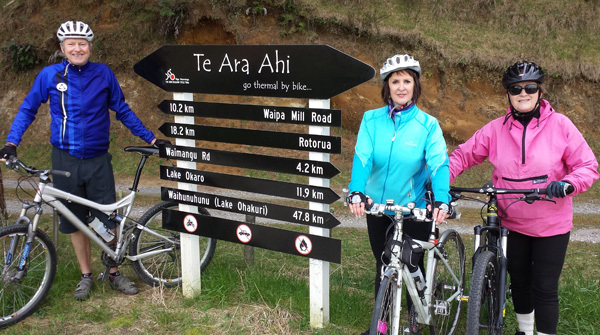 There is no better time than now to visit Rotorua, where you will find sparkling lakes, stunning scenery, countless geothermal attractions and some of the best mountain biking trails on the planet. Our club enjoys the many friendship activities that our membership committee organises during the Rotary year. Some of our past activities included Sunday biking, a ten pin bowling evening, a Rotary golf tournament, and the very popular "Civic Bonding" every Friday night. Youth activities are a big part of our club where members of the youth committee are involved in many activities focused on Rotorua’s young people. Some of these activities include: driver directions at Taupo Motorsport Park for young drivers, the Summer Science School, a head prefects lunch & presentations and a secondary schools speech competition. The international committee is very involved with a wide range of international projects including projects in Fiji, the hosting of International students, funding for Shelterbox, we support ROMAC which brings Pacific children to New Zealand for specialised medical treatment. Rotorua is a bustling hub of activity, with a raft of epic attractions and experiences to suit any and all appetites.